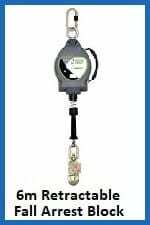 Offering the ability to accommodate users weighing up to 140kg, the FA20 400 06 is a 6m retractable fall arrest block which is built for complete peace of mind for at-height working conditions of all types. The 140kg weight limit provided by the FA20 400 06 retractable fall arrest block is its maximum vertical load capacity, and only applies when used in conjunction with the correct harness. When a fall takes place, the internal brake will kick in and cushion the user’s momentum, so that the force exerted upon their bodies will be under 6kN. Because this type of height safety equipment will often need to be moved, it comes with a handy carry handle on the outside. The casing itself is moulded from resilient polymer, which will prevent wear and tear taking it out of action, even with intensive use. A load indicator at the end where the user attaches to the swivel snap hook will prevent the fall arrest block being over-burdened unintentionally. Alternative retractable fall arrest blocks can be found on our site, like the 3.5 metre FA20 400 03 or the 25-30 metre FA 400 25/30. There is no need to go it alone when choosing retractable fall arrest blocks, wire rope slings, fittings or any other items sold on our site. Our team is here to help, so email direct from our site or give us a ring on 01384 78004. 6m Retractable Fall Arrest Block Overall rating: 5 out of 5 based on 6 reviews.